Has Steve finally found a successful recipe for his favourite failure? Steve Jobs is having another crack at his favourite hobby project by relaunching the Apple TV streaming box with cheaper HD content and a very attractive £99 price point. The new incarnation of the device, which will also be $99 in the US, will feature first run HD movie rentals for £3.49. TV shows from ABC and Fox have been announced for just 99 cents Stateside and Jobs expects the rest of the networks to get on board. All content on the device will be rental only, meaning that no hard drive is necessary on the new device. That explains why the new Apple TV box is one fourth the size of the current model and will feature 802.11 Wi-Fi as well as an ethernet port and HDMI out. The power supply is also built into the tiny little set-top box. In the US, Netflix subscribers will also be able to stream content to their TV, while there's also access to YouTube and Flickr. The device will be available in four weeks and it's available to pre-order from the Apple Store right now. iPod touch, iPhone and iPad users will also be able to use Apple TV to stream content from their mobile device using the new Airplay service. Say, if you're watching a movie on your commute home, you can finish it up on your widescreen TV when you get home. 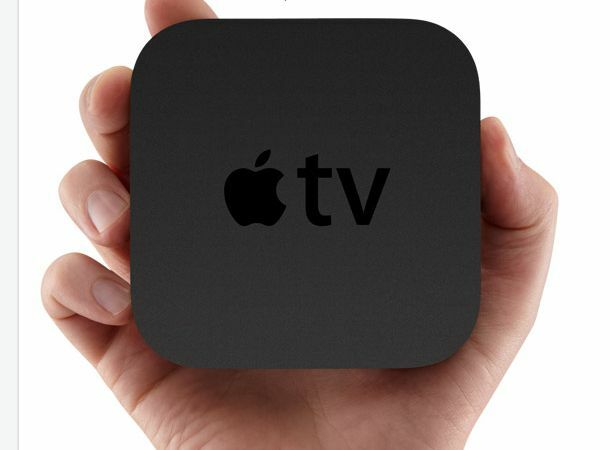 Could this finally see Apple TV become part of the furniture in our living rooms? This looks like a fantastic package, but it's now or never.